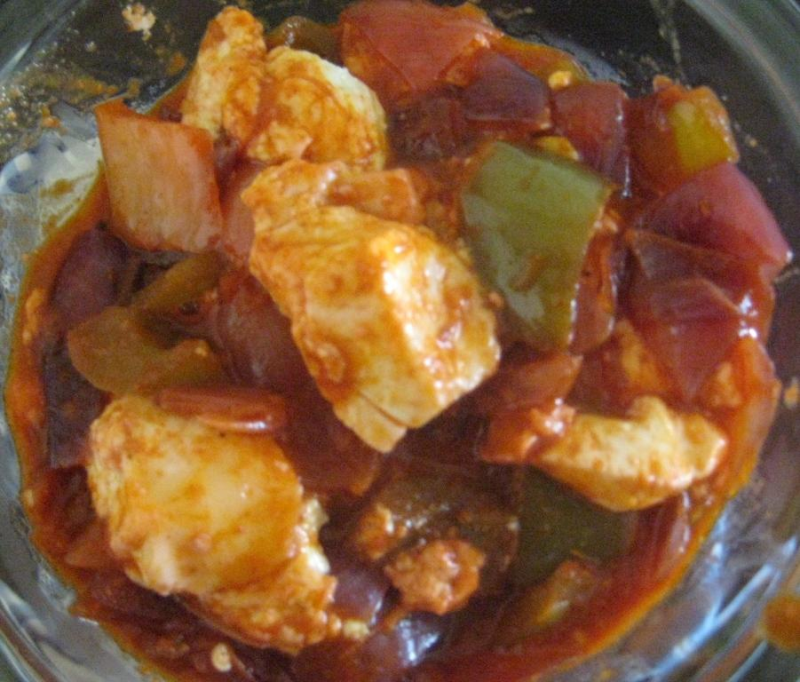 Chinese Chili Paneer aith Bellpeppers, great appetizer or snack. Serve hot in you parties. If you want to serve Chicken just use roasted/ barbequed Chicken instead of Paneer. Rest of the Recipe remains same. Cut cottage cheese/ paneer in 1 inch cubes and keep it aside. Now take a non stick pan and add ginger to it. As soon as Ginger turns pink add Onions. While onions turn little bit crisp and pink in color add bell peppers. Slide down the lid on the pan for five minutes and turn down the heat to low. When bell peppers are little soft and crispy add all dry spices. Now cook the mixture till 5 minutes with lid down on the pan. After cooking whole mixture/masala now add Paneer to this and let it simmer for 5 more minutes.